The Greaser Hotel is an eyesore even by eyesores’ standards. A long forgotten place, it sits dilapidated and mostly vacant amid a sea of Baltimore vacancies. But this building, this former lap of luxury, is much more than it appears. 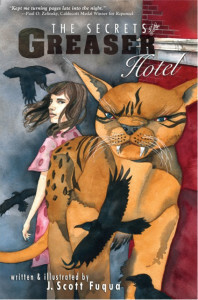 The Greaser Hotel is a place of magic and of secrets peopled by masters of secret-keeping. And soon, for one kidnapped little girl—Allie to her friends and Allie Rat to her kidnappers— it’s about to become a place of the past. In a world of deep friendships, powerful magic, wicked deceptions, and devilish crime, a young girl must fight for her freedom and wrestle with the frightening truths of her past. J. Scott Fuqua is the author of four multi award-winning young adult novels (The Reappearance of Sam Webber, Darby, The Willoughby Spit Wonder, and King of the Pygmies). He has also written two highly acclaimed literary novels (In the Wake of the Boatman, and Gone and Back Again) and the award-winning graphic novel In the Shadow of Edgar Allan Poe. He’s penned and illustrated a children’s book on the history of the Baltimore & Ohio Railroad. For elementary students, he wrote the graphic chapter book Catie and Josephine. His most recent children’s book, Calvert the Raven in the Battle of Baltimore, was the Library of Congress’ National Book Festival Selection for Maryland as well as Maryland’s Center for the Book’s 2013 Selection for kids, and has been written into the Maryland State elementary school social studies curriculum.